Oak Grove (Miss.) won the Class 6A state football championship recently, and the event has drawn particular national coverage because of the team's volunteer offensive coordinator. Yes, the ol' Gunslinger was pretty excited about it all. As the final seconds ticked off, the Warrior sideline erupted in joy, and the center of attention was former NFL MVP Brett Favre, who has volunteered as the Warriors offensive coordinator the past three seasons. "I can't say it's a Super Bowl, but it's pretty close," said Favre. "It really is. It's a different kind of feeling, but I'm awfully proud of these kids." 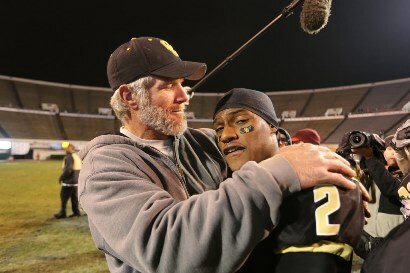 Almost as notable: Favre sported a grizzled beard in postgame pictures (via the AP).